And what a brilliant Friday it will be! I have two weeks left of this term (finals included), and I have to say I’m just about ready to not be at school for a while. I’m usually good for it until about the last 3-4 weeks of the term, and then my interest takes a detour straight into the ground. I’ve done well enough this term, however, managing not to break my record of getting a grade below 90%, so I feel OK about letting things coast a bit at the tail end. I’m just really glad today is the end of the week. I was listening to Mike and Mike in the Morning today, and Mike Golic was talking about Barry Zito’s intentional drilling of Prince Fielder at a Spring Training game yesterday, retaliation for a bit of an “over celebrated” walkoff homer during last year’s run for the Wild Card. Golic’s assessment was that Zito was being a whiner (my word, not his) for meting out punishment for the Fielder move, which happened at the end of the game and didn’t involve Fielder admiring his dinger, but only celebrating with his teammates. His main argument seemed to center around football players who are allowed a little bit of joy in the end zone after a big play. While I think that any comparison of the two games is absolutely ludicrous, it did start me thinking about both sides of the coin. You know who else did that last year? Taken during the Yankees series last year. 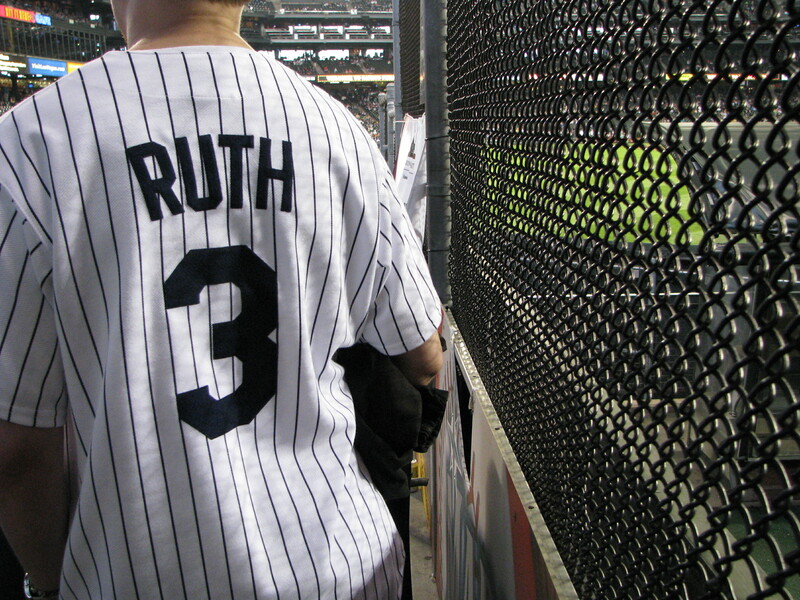 I don’t know who this guy was, but it was undoubtedly the classiest player jersey I’d ever seen for an opposing team. I get so tired of seeing everything sprayed with Jeter’s name, so this was a nice change. I applaud the wearer (even though he had no idea I was taking a photo of his back), good form! Ichiro doing what Ichiro does, around his little right field square. I’d think this was an odd picture except that it’s such a common sight. Come to think of it, you really don’t see that many players taking as much care and time during the game to keep themselves stretched out as Ichiro does. Sure, a guy might reach down and touch a toe once in a while or something, but it wouldn’t surprise me if you could set a watch by Ichi’s game routine. Mark Lowe taking some time to warmup mid-way into a game. I’m so glad he’s sticking around for another year. He used to scare me something fierce, but has since turned into a bright spot in the game, and we’re better for it. Plus, he helps John Wetteland rock the weird, and I can dig it. Where’s the dividing line, though? Ichi did the komanechi (sp.?) thing twice right before reaching the plate, as did a few teammates, before it devolved into the now-traditional home plate jumping scrum. It was distinctive but didn’t last too long. Fielder, however, did a whole choreographed thing at the plate, jumping on home plate triumpantly and flamboyantly, arms outstretched like a matador, as several teammates fell over backwards in a mock-earthquake, leaving him the only one standing for a few moments. That’s the thing – it’s hard to tell. I bet Rivera remembers it, but whether or not NY is willing to take it all the way is a whole other deal. I personally think that celebrating at the plate (once you’ve run in, basically) is not out of the question – but there seems to be a limit known only to the players who perform the celebration and revenge on how happy you should be.